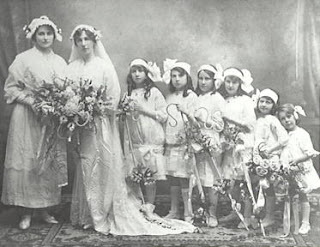 Photographs are a wonderful resource of information and these portray the wedding day of Ethel Mary Isabel Urquhart, grand daughter of James Hunter Lawson - and daughter of (the late) John Ferguson Urquhart of Aberdeenshire Scotland - who married William Earl Blanchard Chadwick in 1914, in the Frazer Memorial Presbyterian Church Springwood. Chadwick was the son of Robert Chadwick of Glenbrook, while James Hunter Lawson, who gave his grand daughter away, lived in the cottage Glen Lawson at Springwood. The ceremony was conducted by Rev. J. McKee assisted by Rev. Ernest Ferguson. 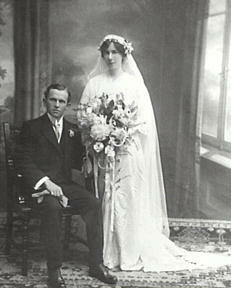 The bride wore her grandmother's Limerick lace wedding veil over a gown of 'dull soft ivory satin' and Limerick lace with sprays of orange blossom. Chief bridesmaid was Miss Eileen Lawson who wore a shell-pink brocaded ninon and a mob cap. 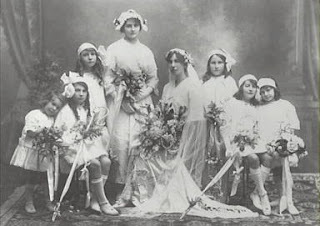 The other bridesmaids were the Misses Lennox; Olga, Jean and Sheila Lawson, and Glennie Chadwick, who wore gold brooches and carried floral crooks the gift of the bridegroom. William Chadwick, cousin of the groom was the best man. The guests adjorned to Braemar after the ceremony where the wedding breakfast was served. The newly married couple motored to the South Coast for their honeymoon. Blue Mountains City Council local studies collection image file. Sydney Morning Herald 17th October, 1914, p. 8. It has been confirmed by the above that Sarah was Sarah Clarinda Blanchard.